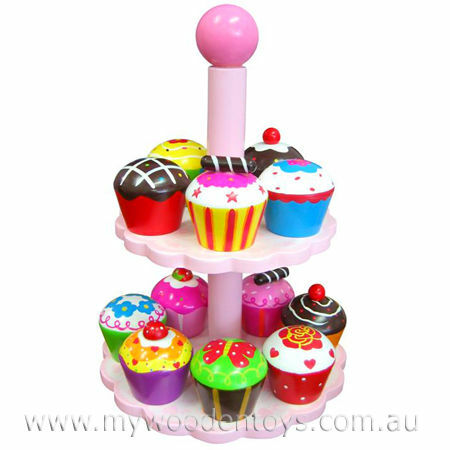 Wooden Toy Tiered Cake Stand With Twelve Cakes is a beautiful well made pink, play cake stand which holds twelve beautifully bright pretend cup cakes. This is a very well made wooden toy with a lovely attention to detail. The round two tier shelves have a white painted doily design and each cake is individual. Material: Wood, Child-safe paint, varnish. We like this because: "Looks good enough to eat"